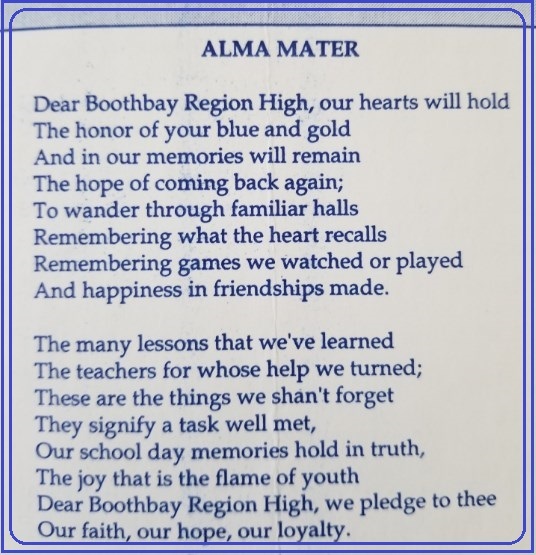 With a large crop of seniors graduating to college last spring and a young team with an average grade level slightly less than 10, the Boothbay Region High School math team did not look very likely to be bringing home a trophy this year in competition against many other schools with an average grade level of 11. Yet the Seahawks surprised everybody, including the coaches, by performing just well enough to lay claim to the third-place trophy for their performance during the entirety of the 2018-2019 regular season among the small schools in the Central Maine Math League. Although no one knew it at the time, the Boothbay team had caught up to the third-place team with but a single round to remaining out of the 30 comprising the full season. They entered the last round tied 384-384 with Wiscasset for third-place and eked out a one-point win based on the final cooperative team round of the entire year. When the announcer during the awards ceremony at the end of the final meet at Cony High School in Augusta called up the Boothbay team to present the trophy, no one on the team reacted, most wondering where this “Boothbay” team was from and why it was using our name. Ultimately, team scoring leader Will Perkins jumped up and the rest of the team followed him to the podium to collect the hard-earned trophy, and to do so with considerable pride. It marked the culmination of a season of significant work and effort by many people, especially by the younger team members who were brave enough to try to tackle many math subjects well beyond their school academic backgrounds, according to coaches Peter and Nancy Gilchrist, who expressed nothing but positive feelings for the team’s performance. Team practices began last September and got off on the right foot when a significant number of students for a school our size expressed interest and joined the squad. Practices and meets have been held every Wednesday since early September and the team members voluntarily stay after school each day to learn some new math or attend a meet against the other schools in the league. It appeared to be a big re-building year for the team, but the performance at the meets was far better than expected from such a young squad and they managed to triumph over not only Wiscasset, by the single point, but also over Carrabec, Monmouth, Searsport, and Winthrop. Islesboro and Kents Hill were the top small schools in the conference. The purpose of the math team is to solidify and augment the classroom mathematical education of the team members and much of the success of the team stems from the teaching they have received in their regular classes. The coaches salute the K-12 faculty for their fine work preparing area students to the point where they fare very well competitively against the students from similar schools, public and private. 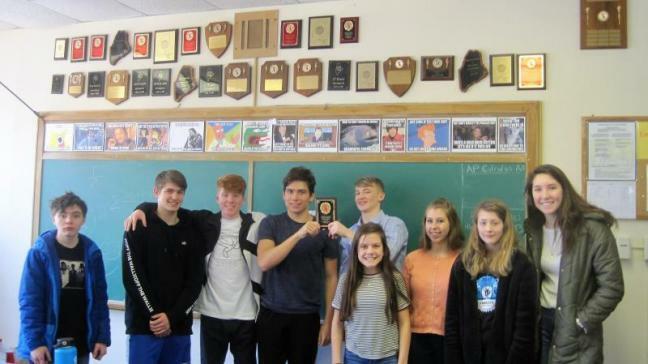 In addition to the five Central Maine Math League meets, the team also takes the American Mathematic Competitions national math test (school winners this year—Will Perkins for upper class students and Kayla Cohen for under class students), the Mountain Valley Conference math meet, and the Maine State math meet. Will Perkins had a fine run at the MVC meet and received a trophy for the second highest scoring junior at the meet, but the full team fell short of earning one of the top trophies. Freshmen: Journey Bennett, Emerson Harris, Kayla Cohen, Della Hahn and Grace Campbell. Sophomores: Jenna Cohen, Cody Field, Bailey Maguire, Graham Harris, Mason Erhard, Ryan Russell, Glory Blethen, Fox Elder and Nathan Chatterton. Juniors: Rowan Kristan, Will Perkins and Ben Rumney. Given a circle with center O and diameter AB, extend segment AB beyond B to point E outside the circle. From point E, draw a secant to the circle that crosses the circle at point D and culminates at point C on the other side of the circle. If ED = AO and the measurement of angle DEB is 18 degrees, find the measure of arc AC. Stumped? Maybe you just found out the internet is useless for doing math problems (which is great!). The Wizard offers this shortcut suggestion: Figure out what Kitty Kallens “Little Things Mean a Lot,” Jimmy Stewart’s performance in Alfred Hitchcock’s “Rear Window,” and “The Catch” by Willie Mays of the New York Giants in the World Series have in common!